When an 800 pound Gorilla walks into a room, everyone notices.? When a world class lens company releases a new camera, few will barely have the inclination to even suggest turning their eyes to acknowledge noticing. ?Sony owned the PMA 2008 news like no other, and the other companies seemed to know it.? That’s what it means to be an 800 pound Gorilla, your competitors have to sit back and watch the beast do what it wants because there’s no way to realistically deny your presence. ?Aside from the Sony DSLR releases there was one lone camera release by Sigma, the lens company which also makes a DSLR which has one of the smallest user bases of any current camera maker.? It could probably be argued that the Sigma DSLR user bases is actually smaller than those of some defunct camera lines like Contax. ?Sigma produces lenses for nearly every camera type, from Canon to Pentax, and even for their own DSLR camera, the SD14 - a camera which has been discounted as much as any camera in history, except for those which were officially discontinued – because despite their best intentions to market a “competitor” few take Sigma seriously when it comes to making digitally enhanced light-tight boxes.? At least, until their development of a pocket camera with a large APS-sized imaging sensor. At Photokina 2006 Sigma announced they were developing a camera from heavens, and showed a prototype at PMA 2007 of the small and powerful DP1 - which was enough to create a butterfly marketing breeze strong enough to light up every photo website on the net and generate universal interest from nearly every user group, from Canon to Minolta. Then came the delays and speculation.? The DP1 didn’t materialize at PMA 2007 and the word “Vaporware” started to spread.? There are many examples of awesome camera products like the Pentax Medium Format Digital, which had nice mock-ups at the PMA and Photokina shows but never materialized in the marketplace.? So it was with great mega-pixel glee that camera geeks across the globe read the news of the DP1 launch at PMA 2008. Like every camera maker, Sigma has a user base of die-hards committed to loving their products till life slips from their fingers – no matter the actual performance and usability of the camera system. 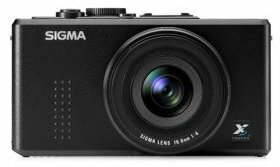 ?However, Sigma is a little different than Canikon, because although their core user base will jump on any product they produce (like the SD14), it doesn’t mean that their customer base will grow by any measurable amount. ?Enter: The Sigma DP1, a camera that a lot of photographers would be willing to drop dollars on if it would only be released – and according to Amazon.com, the DP1 will be available on March 25, 2008 with a price tag of $799. The Sigma DP1 with 14 megapixel FOVEON X3 is set to go on sale in late March.? It will have a fixed f/4 16.6mm (28mm equiv.) lens, with manual focusing capabilities, a hot shoe, optional external viewfinder, and 2.5” LCD screen.? This means a compact camera with a high resolution sensor and a pixel size of 7.8 microns – promising to render smooth images with dynamic range beyond that of every other hand sized camera on the market today. Now the digital camera market has come of age with a compact point-and-shoot camera with a APS-sized sensor, all the image quality capabilities of a DSLR in the palm of your hand.? In short, the God-send camera users have been calling for.? It is true deliverance from the camera Gods, a high resolution, high quality compact camera with an affordable price, something not seen since the film days when a compact Contax G1/G2 could match the image quality of any top-shelf SLR. Of course, many people have already counted the DP1 as being a flop.? The rationale being that with a 28mm equivalent lens and a “slow” aperture of only f/4, and a maximum ISO of only 800, a number of folks don’t even want to consider it as a digital imaging tool.? Which is sort of the reception the Ricoh GRD first received, but it since risen to become a cult camera favorite. And I would discount the DP1 too if I listened to the gadget-junky-fools on the net.? The thing is, I like to “use” the cameras that I buy, and getting down to Brass Tacs, my Fuji GA645 and GA645w film cameras (both with a slow f/4 lens) produce incredibly sharp, amazing results in a relatively small package.? The Fuji auto-focus 6×4.5 rangefinders did well in their day, but with the advent of digital the cameras didn’t make the impact they deserved and are now only found on the used market. But the Sigma DP1 is different, it will find a profitable niche, because once people start using it, they’ll no doubt find that having a high performance tool in the palm of your hand is much better than a $2,000 DSLR-lens combo which sits around on your desk half the time because it isn’t convenient to take everywhere. ?I know for a fact deep down in my heart that at the very least the DP1 will be a killer landscape tool for the mountaineers and travelers of the world, and if a wide angle and telephoto converter were offered, (as are available for the Ricoh GRD line) it would be the perfect travel package to tool around the globe with.